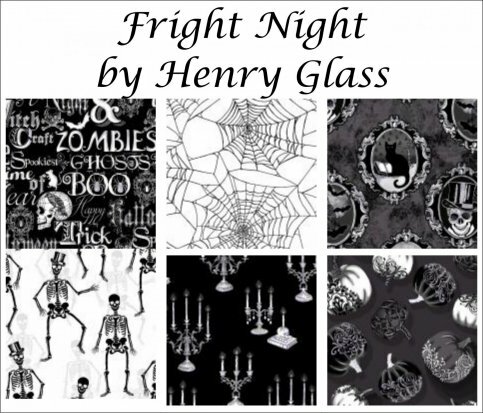 Here are just a few of the gorgeous fabrics we've received over the last few weeks. They're even more beautiful up close and personal! 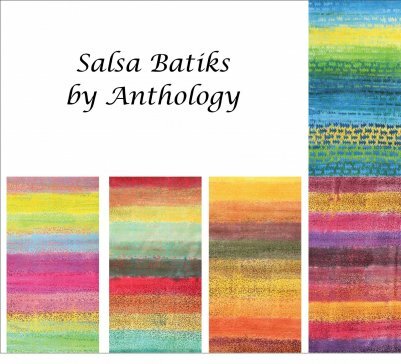 The Salsa Batiks have rich colors and wonderful textures. 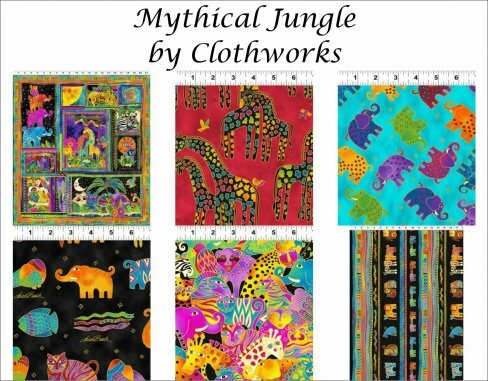 Mythical Jungle (Laurel Burch) is vibrant and fun, with hints of metallic. 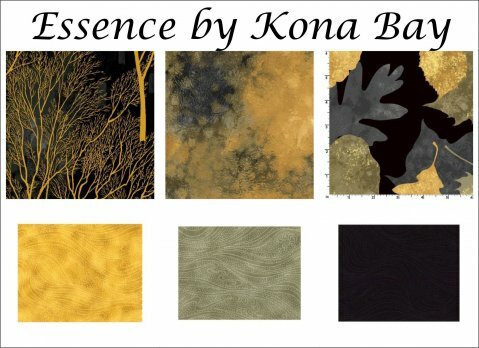 Essence is exquisite in black, taupe, and metallic gold and would make stunning fall projects. Fright Night is just plain fun! Monoprinting & Paintsticks on Fabric. 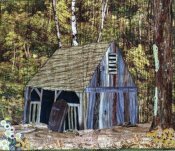 Have you ever wanted to try your hand at art techniques on fabric or make an art quilt? 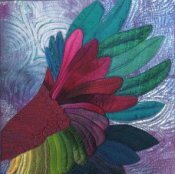 This 4-hour class will give you an introduction to printing on fabric so you can create your own surface designs that can be worked into any textile art project. Sandra Mollon, Friday, May 26, 10:30 a.m. - 2:30 p.m., $40 teaching fee, supply list. Summertime Sampler. Celebrate summer with this jewel-tone, whimsical wool sampler. The blocks in the book are beautiful with simple stitches, but Beth will help you take yours to the next level by adding more embellishment stitches. Come into the shop to see the three blocks that Beth completed (pictured here), and we're sure you'll be hooked. You will sign up for three classes at a time (one block per class). Beth Kondoleon; 1st Sunday - Jun 4, Jul 2, Aug 6; 12:30-3:30 p.m., $60 for three sessions. Students must purchase the book, Summertime Sampler, and other supplies. Little Horse Barn in the Woods. This little wall hanging causes oohs and aahs from viewers of all ages. It brings back memories and is a very doable quilt. First, you build a barn, board by board. Then you put on the roof, do some thread painting, and voila, you've built a barn. 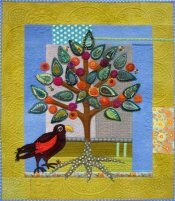 Next, grow a mature tree, using fabrics, yarns, trims, etc. Sue has even used the webbing from an Easter ham on one of her trees! So don't miss out on the fun. You CAN do this. Sue Rohrke, Thursday, June 8 & 15, 10:00 a.m. - 4:00 p.m., $70 for the two sessions, supply list. Wool Pumpkin Table Runner. Another beautiful project from the book, "Gorgeous Wool Applique"! 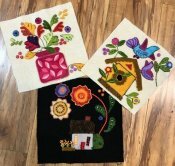 You'll learn how to applique on wool and enhance your project with different embellishment threads and stitches. Beth will also teach the "big-stitch" quilting technique to finish your project. Beth Kondoleon, 3 sessions - Wednesday, June 21, July 19, and August 16, 10:00 a.m. to 1:30 p.m., $60 for 3 sessions, supply list (including the book). African Marula Tree (Sue Spargo). The Marula is regarded as a sacred tree in Africa and often the spiritual center of villages. Sue's African Marula design is a blank canvas for you to unleash your embellishing creativity. You will choose your own fabrics and embellishment threads. You can follow Sue's pattern or make yours into a family tree, a travel journal, or anything else you can imagine. The finished size is 25"x 28". This is a class for beginners and advanced stitchers. 4th Tue, 9:00 a.m. - 2:00 p.m., Jun-Aug 2017, Judy Cummings, $105 for three classes, supply list. you get 10% off that fabric!